The flat’s titleholder, a woman known only as Mrs De Florian, never returned to the apartment and never rented it out. Its existence only came to light in 2010, when Mrs De Florian died without issue at the age of 91 and experts were brought in to value the property. 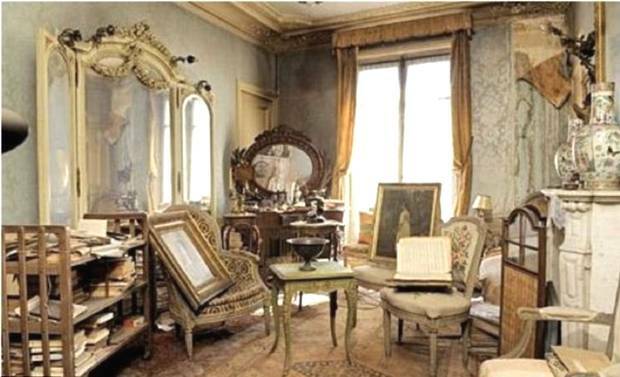 The flat, which is close to the Pigalle red-light district in Paris’ 9th Arrondissement, was said to be like a “stumbling in to the castle of Sleeping Beauty” by one expert, as a room full of artworks and beautiful furniture was discovered behind its long-locked font door. One specialist, Oliver Choppin-Janvry, said he was particularly impressed by a tableau of a woman in a pink muslin evening dress, which turned out to be a work by the 19th Century Italian artist Giovanni Boldini. As if to complete to fairy-tale discovery, it later emerged that the beautiful woman in the portrait was Mrs De Florian’s grandmother Marthe, who had been a renowned actress, socialite and Boldini’s muse. Although the never-exhibited artwork was not signed by Boldini, a love letter accompanying it identified the work, and it was later dated to 1898 after a reference was found in a book by the artist’s widow. Originally put up for sale at £253,000, an astonishing ten bidders pushed its final sale price up to almost £1.8 million – no doubt partially inspired by the astonishing story behind the long-lost piece.